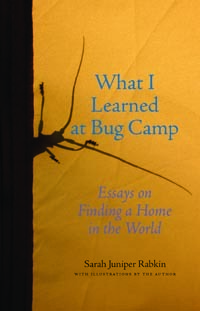 SciCom alumna Sarah Rabkin, class of 1985, has published What I Learned at Bug Camp: Essays on Finding a Home in the World (Juniper Lake Press, 2011). The nonfiction collection fuses personal essay and science journalism, enriched by Rabkin's own illustrations from her explorations as a naturalist. Rabkin's "fluent, spirited prose probes the spaces between science and art, autonomy and community, doubt and faith," the publisher states. "On a passionate quest for a 'home in the world,' she creates bridges out of stories, inviting us to join her on the trail." "How do you find your way, if you set out to follow your heart? There are tough questions and hard-earned answers in Sarah Rabkin’s wonderful collection of essays. . . Everyone who aspires to live intentionally and honorably in this lovely, careworn world will want to read this book." "Through the gift of Sarah Rabkin’s graceful and generous-hearted prose we see the world as a unified and delicious whole. . . She’s a careful thinker, an elegant writer, and a fine companion." Rabkin earned her A.B. in biology from Harvard University and her graduate certificate from the Science Communication Program. She is a longtime lecturer at UCSC in the Writing Program and the Environmental Studies department. Her freelance writing has appeared in Health, Hippocrates, the San Jose Mercury News, and the Edell Health Letter. Rabkin also is a freelance instructor for the Yosemite Association and outdoor education schools, and she leads an annual series of workshops in natural history illustration and observation.